November is Osteoporosis Month in Canada. As a 52-year-old Fitness and Pilates Pro, I am very much interested in maintaining and increasing my bone strength and that of my clients. Muscle strength is important, but without bone strength, we are at risk for spine, hip, and other bone fractures that can negatively affect our quality of life. What do Gwyneth Paltrow, Meredith Viera, Sally Field, and Ursula Andress have in common, other than being talented, famous, gorgeous women? The answer is that they all have osteoporosis. If you are unfamiliar, osteoporosis means “porous bones.” People with osteoporosis, or low bone density, are at greater risk of slow or non-healing fractures, including crush fractures in the spine (leading to the “humpback”). Our skeletons reach maximum bone mass (amount of bone tissue) and density (how tightly that bone tissue is packed) in our 20s. After that, we start to lose more bone than we produce each year, and certain medical conditions can make things worse. Luckily, it is possible to slow down and even prevent bone loss, as well as improve bone density, with careful attention to bone strengthening exercises. Bones get stronger when they are stressed, by either gravity or resistance. Higher impact, weight-bearing exercises like running, walking and dancing, along with standing exercises and resistance exercises (using weights, bands, springs) are the best, along with some good posture exercises and training in how to move your joints without moving your spine. Start with no weight at the most basic level. If that is easy, or when it gets easy, add weight. When that is easy, remove any prop. And then, when that is easy, add more weight! While exercise should be hard, working out should not hurt your joints, neck, or back. If that happens, stop and back up (no weight, small range of motion, etc.). Keep your abs engaged, like a corset pulling in and up all around your waist, and do not flatten or move your spine. Modify any exercise by reducing weight, reducing the range of motion, and/or shortening your levers by bending arms and legs (for example, plank on forearms vs. hands). Squatting should not be scary. Basically, a squat is simply sitting down and standing back up. If you haven’t squatted in a long time for exercises, start with a chair behind you. Sit down and stand up, with your tail back and chest up, moving only at your hips, knees, and ankles. Try not to use your hands. When you can do that ten times easily, add a weight. When you can do two sets of ten, step away from the chair. With no weight, still pretend like you are sitting – your upper body will hinge forward a little bit at the hips, and you should sit back, not straight down, with weight on your heels. When you can comfortably do this ten times, add the weight as above. You can hold two dumbbells, one in each hand by your sides, or hold one dumbbell or kettlebell in both hands, bent elbows, weight close to your chest. The deadlift teaches us how to pick heavy objects off of the ground without hurting our backs. It also strengthens the legs, back, abs, and shoulders. Start this one with weight! It will help. Stand tall, holding a weight in each hand with arms by your sides. Bending your knees as much as you need to, hinge your torso forward at the hips until you almost put the weights down, keeping your spine long, shoulders back, and abs supporting. Stand back up, keeping the spine straight, moving from hips and legs. When you can easily do this ten times, add weight. When two sets of ten with that weight is easy, add some more! The Plank and Push Up help us maintain core strength, along with upper body strength (great for wrists, elbows, shoulders). Start on all fours, with wrists under shoulders and knees under hips. Straighten one leg back behind you, with the ball of foot on the ground. Add the second leg, until you are balanced with your body in one straight line, facing the ground. Keep tailbone pointing slightly up, really push into arms, reach your breastbone forward. Strong legs, arms, back, and abs! When you can hold this, add a small bend/straighten of your elbows, increasing the range of motion as you get stronger. 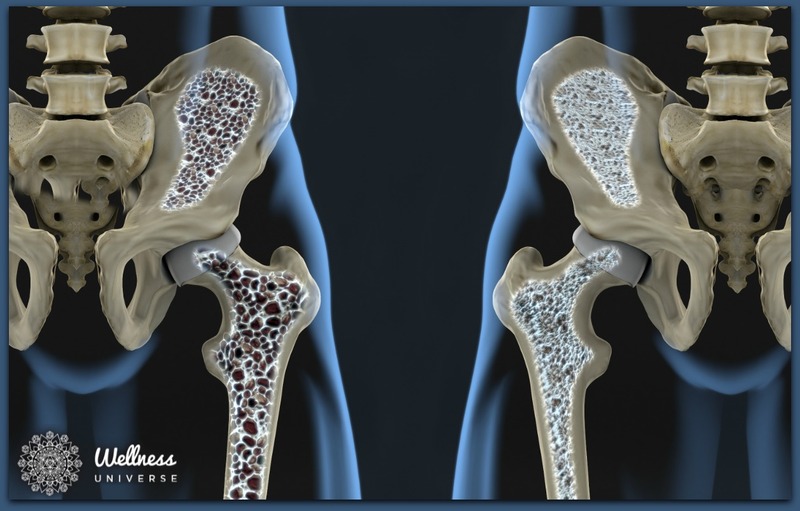 Are you concerned about osteoporosis? Stay active, stay upright, and keep putting stress on your bones!